I Can Finish ANY Never-ending Story. That title looks like a story in and of itself. Are you going to elaborate? No. I started a post and then gave up. Of course I’m going to elaborate! Anyways. There are hazards of being amongst the many Child Actors. And I’m not talking about being pulled through a vortex into an alternate universe. No, I’m referring to other Child Actors. You see, as a playing group, we moved around a fair bit, and so we never really got to interact with others outside our acting group. That didn’t bother me. What did bother me were the conventions. Conventions? Like, things you do, even though you don’t know why?? Not that type of convention. No, I’m referring to large gatherings of actors, and their families. There were usually small ones about once a month that our group would go to. The large ones happened about every year. Now, don’t get me wrong. I enjoy seeing other people, and spending time with other actors. The trouble, as I’ve mentioned before, is that the children are often forced into “children friendly” activity areas. With games. Stupid, pointless, monotonous, tedious games. Some were designed to “help us grow” and “improve group spirit and understanding”. Others were just designed to kill time while those in charge waited for our parents to come by and pick us up. Fortunately, I am a decent enough actor to get out of most relays. All I needed to do was feign a cough or a cold, or fake vomit a few times, and the leaders would eventually decide it wasn’t worth it to make me play. After all, I am a melodramatic actress; I can turn anything into a production! The one game I could practically never get out of, however, was the “Never-ending Story.” I don’t even see how it qualifies as a game! I mean, really. You all sit around in a circle. The leader presents the beginning of a story, and the next person in the circle is required to come up with the next sentence, to continue the story. If we were all playwrights, that would be one thing. But no. We’re all children of actors; only some of us had been talented enough to actually be onstage, as I had. So some of the children couldn’t even add the proper flair to even a story. For the first several years, I tried to participate as they wished. After all, it’s a stretch of my creative and dramatic skills. But eventually, I just got fed up. When I was twelve, and we were next at the huge convention, I took my chance. With that, the story (at least in my own mind) was finished. Well, not quite. It would have, if we were following the rules. But instead, everybody protested that my comma actually marked the end of the sentence; the words “the end” were not actually contained in my portion. I mostly just stopped listening. But still, after about the third time I was in a game and killed all the characters, the leaders eventually learned to let me not play. I think that a number of people besides me were a bit disappointed, actually. That was never a very popular game. If you are, in fact, following the rules of the Never-Ending Story, that one sentence can end the story. And if, as I proposed earlier, the point of the game is to make a sentence impossible to follow, that sentence is guaranteed to win. Happy Sunday, everyone! And happy Easter! Oh, right! Happy Easter, everyone! I hope you have a blessed day. This entry was posted in fluffy, pointless and tagged Fluffy's world on March 31, 2013 by Fluffy McGiggles. What else could be fluffier? 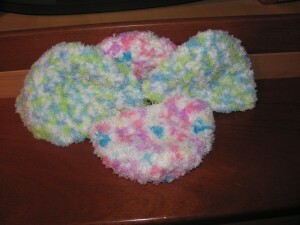 So, a group I know about is collecting crocheted baby clothes to give away. And so do you know what that means? I HAD A LEGITIMATE EXCUSE TO BUY BABY YARN!! and USE IT!! What, buying inspiration for your website’s color scheme wasn’t enough? Please. I’ve already designed the color scheme. How can I be buying the yarn for inspiration? Don’t look at me. You’re the nefarious one who’s occasionally mentioned the equivalent of time-travel on other pages. Just to clarify… You’re saying that I’m smart enough to have figured out how to go back in time, to change the color scheme, to reflect this post? I’m honored! But… wait. That doesn’t even work; I couldn’t find yellow yarn, so the yarn doesn’t actually match perfectly! Oh, dear! What’s the point of being a time-traveler if I lose all my ability to color coordinate? You call this website “color coordinated”? Although, now that I think about it, the website’s colors might have impacted which yarns I bought… Huh. You seriously bought yarn to coordinate with your website? Anywho, happy Saturday, everyone! I hope you all have a wonderful day. This entry was posted in crafts and projects, real world, Webmaster and tagged baby yarn, crafts, crochet on March 30, 2013 by Webmaster. I have recently come across a new favorite small animal: the Dik Dik. I’m just trying to stay up to date on trends! Anyways, I thought I’d list 5 of my favorite legends about Dik Diks. The Dik Dik is named for the sound its hoofs make when it walks. dik-dik dik-dik, dik-dik dik-dik… I don’t know if this is true or not. If it isn’t true, it should be! Dik Diks are leprechauns in disguise. I mean, look at them. Dik Diks are about 8 inches tall; leprechauns are about 8 inches tall. There’s the correlation. And as every student knows, correlation implies causation! So therefore, Dik Diks are Leprechauns. QED. Dik Diks can jump higher than an average house. This is due to their legs being stronger than they appear, and the fact that the average house doesn’t jump. Dik Diks are some of the last signs that fairies are real. After all, if they’re leprechauns in disguise, fairies clearly exist. Even if they are not leprechauns in disguise, those miniature animals must be used for something: Mounts for the Queen of Fairies! Therefore, fairies are clearly real. If you stare too long into a Dik Diks eyes, you get pulled into space. I mean, seriously. Have you seen pictures of their eyes? Those adorable little deep black eyes of absolute cuteness? They’re just calling for you to get lost in them. And to fall of the end of the world into space. So, there you go! Happy Friday! For the record, I don’t agree with any of that post. Except for the “happy Friday”, part. That I agree with. So, have a great weekend! This entry was posted in ANIMALS!, list, pointless, procrastinate, real world, Webmaster and tagged animals, cute, legends, myths on March 29, 2013 by Webmaster. I came across an absolute gem today: An instruction manual for a video camera. I know, right? It’s amazing what technology can do! There was, of course, an abundance of generic “bad-grammar” throughout the entire instruction manual. But those were the highlights. You really do idolize people who use bad grammar or write poorly, don’t you? …I don’t think I can answer that one. Anyways, do you want to know the sad part? …Those weren’t the sad parts? The sad part is that the instruction manual was actually better designed than the camera itself. Please. Tell me you’re joking. Not even slightly. Fortunately, the camera itself was a freebie. But even so, the joke goes that we still paid too much for it. The instruction manual was totally worth it, though! I love “magic stickers”, don’t you? This entry was posted in Book Review, pointless, procrastinate, real world, Webmaster and tagged Book reviews, technology on March 28, 2013 by Webmaster. Today, I read this article about chickens. You might want to check it out. Ok, back yet? Isn’t that interesting? I had no idea that chickens ate egg shells… Or eggs, or chicken… That’s just bizarre. Although that does bring me to a random question. If “we are what we eat”, doesn’t that make us all cannibals? Yes. If Cannibalism is eating “what you are”, then you are, by definition, eating what you will be, which means that you’re eating what you are, which means that we are all cannibals. … Yes, Webmaster. Whatever you say. No. I was just trying to get you to stop this post before anything more awkward came up. Anyways, happy Wednesday, everyone! I hope your week has been going well. This entry was posted in ANIMALS!, real world, Webmaster and tagged animals, offsite, pun on March 27, 2013 by Webmaster. I recently came across a classic work from your world: a book called “Pride and Prejudice”. Oh, yes! I love that one! Without further ado, here are some of the top lessons I learned from Pride and Prejudice. If you have wealthy acquaintances, you can get away with anything. I mean, just look at Mr. Wickham. He goes into debt, and Mr. Darcy pays that off. He tries to behave immorally with Mr. Darcy’s sister, and he gets paid off. He takes advantage of a 16 year old girl, and again goes into debt, and Mr. Darcy again pays off his debts. Mr. Darcy doesn’t even like the guy, but Mr. Wickham pays none of the consequences for his actions. So clearly, if you’ve once known someone who is wealthy, you can get away with anything by blaming all wrong on your wealthy acquaintance. But Mr. Darcy was doing it out of love for Elizabeth! It would have been a disgrace to let Elizabeth’s sister bring such shame upon herself and her family. It doesn’t matter how horrible someone is on the outside. Deep down, if a person is really an arrogant, prideful person, there’s actually someone inside who’s a kind, considerate, and compassionate person. Never mind the fact that it’s totally different from how you’ve ever seen that person before. Yes, I’m talking about Mr. Darcy here. Ok, so in the Bennets’ home town, Darcy is described as not very pleasant. And everything that we see points to that fact. The only thing going for him is that he’s rich. But suddenly, after he comes out, professes his love for Elizabeth, and is rejected, he magically transforms. Except, you later find out, the transformation isn’t magical. According to the housekeeper, who’s known him since he was 4, he’s always been a charming boy, and always very nice. Really? So why does this not come across anywhere else? Or anytime before that? But, it’s romantic. And I’m sure there are hints that he’s nice in the book! It’s just that you’re looking at it through Lizzy’s perspective. And she sees only the bad, and so therefore the reader sees only the bad. That may be the case, but the author should still have given us a bit of a heads up that he’s actually not the most conceited, arrogant, prideful, uptight gentleman in existence. Or that if he is, there is some worthwhile quality within him. Your history with a man doesn’t matter, as long as he’s rich. It’s only after Elizabeth Bennet sees his lovely home, and how expensive it is and what sort of society she could enter, that her attitude starts to soften towards the idea of marrying him. Alright, so she also sees his “true character”, but you can look at my second point for my thoughts on that. “Negging” is a good way to get a girl. (Heads up: Slightly foul language in this xkcd explanation of “negging”.) Mr. Darcy starts off by belittling Elizabeth. This makes Elizabeth feel slightly inferior. When Darcy comes out and professes his love, she at first is (rightfully) indignant that he would think that she would love him. But then, as she stops to think about it, she’s flattered by the attention of someone so superior to her. Negging. It’s ok to totally mess up someone’s life, as long as you’re friends. Again, Darcy. He almost totally ruined Mr. Bingley’s life. Mr. Bingley was in love with Jane. Jane was in love with Mr. Bingley. Mr. Darcy comes along and persuades Mr. Bingley that Jane didn’t really love him. (Wuss for believing it…) And then, when Mr. Darcy finds out that Jane is in love with him he… still doesn’t say anything. It’s not for quite a while after that Mr. Darcy starts to rectify the mistake. But that’s ok! Mr. Bingley is still friends with him, and trusts his ideas implicitly! Hooray for friendship and trust, never mind the fact that so totally trusting that person led to a great deal of unneeded pain! Because we’re friends! That’s certainly an interesting view of the book. Readers, please note that I do not necessarily agree with everything that Fluffy said. Suit yourself. Anyways, what do you think of Pride and Prejudice? This entry was posted in Book Review, fluffy, real world and tagged Book reviews, Pride and Prejudice on March 26, 2013 by Fluffy McGiggles. Sleeping as an Art: Who Cares? Words cannot express how offended I am. Is there any particular reason for it today? Yes. Someone has persuaded people that sleeping is an art. …And that’s offensive how, exactly? It’s a human performance they’re considering art. And there’s no script. Or any talent. It’s not real ACTING! Ah. So this is the actress in you being offended? What do you mean, “The actress within me”? I am the actress within me! So, are you more offended that someone’s actually doing this? Or just that she is actually well known on this world? I am not going to dignify that with a response. Anyways, Happy Monday! Have a good week. This entry was posted in fluffy, pointless, real world and tagged acting, art on March 25, 2013 by Fluffy McGiggles. Yes. Proper etiquette for giving cookies. You have official etiquette guides for giving cookies? You don’t? We have an entire book on when to give cookies. For example,with travelers. When you’re traveling, and going to be staying in somebody’s house, you bake the person cookies. If you’re there for two nights or less, you bake exactly a half-dozen cookies. More nights than that, and you bake a dozen. Now, the fun comes from when you are having a guest over. It is not explicitly written in the etiquette book, but it’s assumed, that you will bake either a half-dozen or a dozen cookies for your guest, in order to make them feel welcome. It’s “optional”, though. Of course. Yes. But as I was saying, that’s where the fun comes in. After all, you want to potentially outshine your guest in terms of cooking abilities. So frequently, visiting somebody else turns into a “bake-off.” The host usually “wins,” though; it’s really hard to beat fresh cookies. Hm. I guess that makes sense. Yup. It gets to be really interesting when both the guest and the host are trying to cut back on cookie-consumption. Etiquette still requires a full dozen cookies when you visit. And suggested etiquette (and competition) require at least matching your guest. But such things can be ignored when both of you end up not baking. So it’s quite interesting. More often than not people end up baking. But not always. It’s a fun dynamic. Well, Happy Sunday everyone! Do you have any interesting traveling traditions? This entry was posted in fluffy, pointless, procrastinate and tagged cookies, etiquette on March 24, 2013 by Fluffy McGiggles. Today, in light of the Webmaster’s recent posts, I’m going to share with you some of the drivel of my world. Would you believe that some people actually think this is true? There once was flock of sheep. Magic sheep. These sheep were soft as the clouds, and white as fresh fallen snow, and they were governed by their king and queen, who had wings! Their wings were soft as the windblown grass that covered the plains of their homeland, and they had as many colors as the many butterflies that flitted from place, to place, to place around them. The King and Queen had seven daughters, who were all as lovely as the dawn is bright. The youngest was particularly beautiful, in a sheep-like way. As she went out to nibble daintily on some clover one day, she spied something in the realm that was not BEAUTIFUL and FLUFFY. It was a dark brown, scabby, angular BEETLE. The princess screamed in revulsion and ran away. But quickly, upon seeing the beautiful sun and the flowers, her heart softened, and she thought how she must have frightened the poor thing that couldn’t help its unfluffy appearance. And so she returned to the beetle, which was just as unfluffy before. The beetle turned to her and said, “Do not be afraid, princess! I was not always as you see me now. I used to be a BUTTERFLY! I was enchanted by an EVIL SORCERESS who said that ‘because of my vanity for my beautiful wings, I would never regain my natural glory until I became as beautiful on the inside as out. Which doesn’t take much for a beetle. The princess had never been there, but she was true of heart, and eager to help this poor unfortunate creature. After days of travel, she, with the beetle ever on her head, or shoulder, or coat when it got cold, made it to the top of the cliffs of the Marshan Mallows. At this point, the princess had grown accustomed to the beetle’s interesting conversations and unique way of looking at the world, and shee was sad to see him go. But because she knew that he could not stand living the rest of his life as a mere beetle, she took him and flung him off the cliff in the midst of the wind that howled the Cliffs of the Marshan Mallows. There are two versions to this story. Well, three, if you include the one that the boys tell each other. The boys say that the beetle had always been a beetle, and had made up the story to be able to talk to the princess for the remainder of his days. The boys say that he fell to his death, but at least he was happy. The traditional version of the story says that the beetle was flung out into the wind and was immediately transformed into a beautiful butterfly, in fact the king of the butterflies! And from that point on, the butterflies and the sheep were always the bestest of friends. But the last version of the story, which is the one that girls tell each other, is that when the beetle was flung into the magical wind, he didn’t just become a butterfly, but his new inner beauty transformed him into a young winged ram, as handsome as the sunset. The princess and he were soon wed, and their descendents can be the seen in the skies, even today, as the most beautiful of the clouds. This entry was posted in Uncategorized on March 23, 2013 by Fluffy McGiggles. Hello, everybody! Welcome back to the top responses to being given an angry banana! We left off at four. Oh. You were serious about making it two parts. Of course! You were emphatic about my getting enough material. And since I had enough for two posts, I’m going to use it! 6. Use it as a boomerang. If you use a banana, that’s just sort of lame. If you use an angry banana, there’s a slim possibility that it will go out of its way to hit your target, because it’s angry. Or it might refuse to come back, because it’s angry. Which means that you wouldn’t need to worry about dealing with an angry banana. Or, it might refuse to hit the person you aimed at, and then come back and hit you in the face. 10. Pacify it with an amiable grapefruit. Maybe the banana’s angry because it’s lonely! If you give it a friend, and a friendly friend, I bet it would get much more cheerful. After all, wouldn’t you be happier with an amiable grapefruit buddy? So there you go, folks! Ten uses for an Angry Banana. Wait a second… I think you mean 9. I saw what you did there. You changed the last 7 to 8. Instead of 9. Ok… So I may have been slightly off on how many best responses I have… So fine, real ten: Do a close up portrait of its expression. Happy Friday, everyone! I hope you have a great weekend. This entry was posted in list, pointless, procrastinate, question, Webmaster and tagged list on March 22, 2013 by Webmaster.